Nightmare Before Christmas, Jack Skellington & Sally, customized with your names and date. A wedding or anniversary printable gift, ready to download and print within 24 hours. 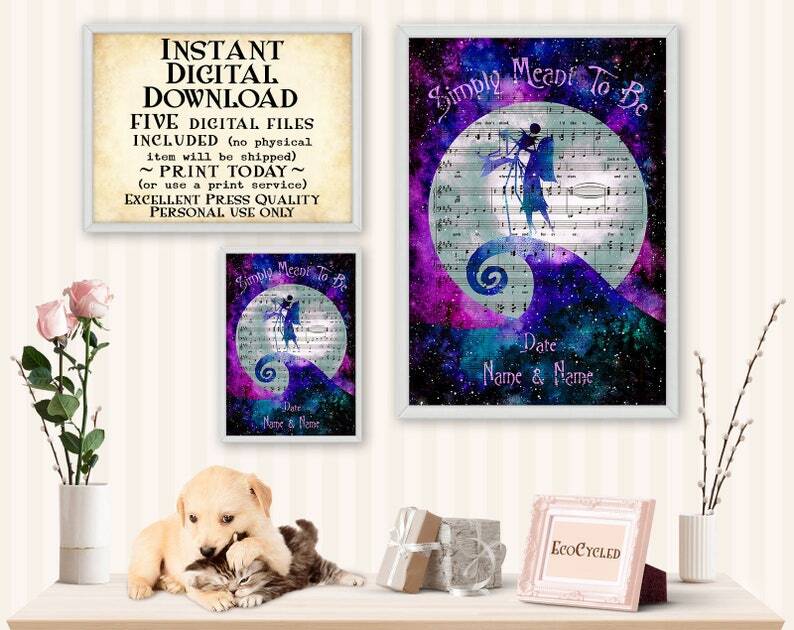 The Simply Meant to Be song, like a book art print, are in the background. Purple version. DIGITAL DOWNLOAD, NO PHYSICAL ITEM WILL BE SHIPPED. Customization takes up to 24 hours. Customized digital downloads are listed as physical items instead of digital downloads. They are NOT available instantly, as Neece needs to create them for you. You will still receive only digital downloads, but they will be sent by email from EcoCycled [!at] gmail.com. Up to FIVE files are included in your downloads. All of the files are 300 dpi and large, which is excellent print press quality. 8.5" x 11": Standard printer paper size.